NEW! He is still quite small, the cute bear with the shining eyes. However, the young bear comes from a family which is "large" in every sense of the word: it is the family of the grizzly bears, who are in turn descended from the brown bear family. So this little grizzly from Steiff also has an exciting future full of bear adventures and formative encounters ahead of him. The way this wonderful bear with the shinning brown, dark tipped fur made of high quality alpaca looks at the world with his laughing eyes, it seems that he is looking forward to it. The grizzly's head, arms and legs are fully poseable and pads on soft soles, which are made of Belleseime, and elaborately embroidered on the balls of his feet. With his open mouth he greets his new owner and Steiff lovers joyfully. 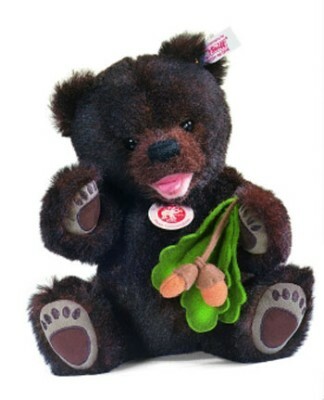 As the resourceful, fast working little bear has a big appetite, he brought something tasty to snack on: in his left paw he is holding a branch with acorns on it, which are made of wool felt and lovingly decorated with an airbrush process. The extremely likeable Steiff grizzly is making his way to his new home, in a limited edition of 2,009 bears, and proudly shows his gold plated Steiff "Button in the Ear".